City Students take part in the Visa Design Jam to develop future methods of payment for retail and in-vehicle purchases. 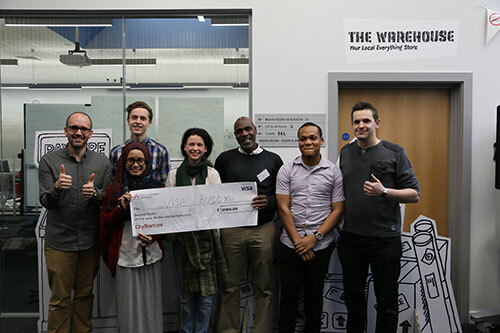 Over 100 students take part in Beyond Plastic - 'off the rack, on the road' the second design jam held in partnership with Visa Europe Collab with and aim to develop future methods of payment for retail and in-vehicle purchases. The lower ground floor of Drysdale was dramatically transformed into 'Cardlessville' a town where only future payments are accepted. The town featured a clothes shop - Shoptop, a petrol station - Future Fuel and an e-tailer - Warehouse; providing a truly immersive experience in which students could re-enact real world shopping scenarios. Participants could also enjoy time out in our field as well as more intensive brainstorming time in our think tank. Each stage was led by industry experts including the City Interaction Lab Manager Stuart Scott, Entrepreneurship Education Manager Alex Elkins and City Law School Alumnus Nic Gray; now at Fluxx a local innovation agency. The winning team was Visa Buddy; A mobile personal finance assistant that provides an overview of your finances across multiple accounts, including advice and reminders on when to top up or which account to spend from. As an additional feature, it also offers a discover mode, allowing the user to find the best local deals for lifestyle and shopping. Their mentor was Luidmila Kayukala - a recent graduate from the Masters in Innovation Creativity and Leadership Programme. The team received £1,000 and also the opportunity to work with Visa Europe Collab to further develop the idea into a working product. You can see the Visa Design Jam Storify here.